Jean Paul Gaultier has launched the annual limited edition summer versions of Le Mâle and Classique for Summer 2014. * This year, they're adding a summer version of 2013's Le Beau Male. The theme for 2014 features coral, starfish, anchors, mermaids and octopuses. You can see past summer editions from the brand here: Summer 2009, Summer 2010, Summer 2011, Summer 2012, Summer 2013. Le Beau Male Summer 2014 ~ With lavender, mint, violet, sandalwood and musk. In 125 ml Eau de Toilette. Le Mâle Summer 2014 ~ With notes of lavender, mint, cardamom, grass, leaves, vanilla, musk and sandalwood. In 125 ml Eau de Toilette. Classique Summer 2014 ~ With notes of mandarin, lemon, rose, orange blossom, jasmine, ylang-ylang, lily, iris, vanilla, musk and amber. In 100 ml Eau de Toilette. 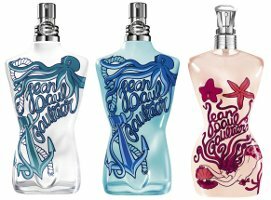 Jean Paul Gaultier Le Beau Male Summer, Le Mâle Summer and Classique Summer can be found now at Douglas in Austria. * The notes have not changed for the past few years. It would be so nice for Jean to do a bottle that wasn’t that headless mannequin..it’s so tacky.